Unwanted body hair is a nuisance for both men and women. Many of the quicker methods of hair removal such as shaving or using depilatory creams only last a day or two and the longer lasting options like waxing and threading can leave you with painful and unattractive ingrown hairs, with hair growing back within a couple of weeks. Also, salons are gradually increasing their prices making these longer-lasting methods of hair removal less affordable. Many more men and women are now turning towards long-lasting, permanent methods of hair reduction and removal instead. To help you decide if permanent body hair removal is right for you, we are going to discuss the different options and see what methods can be done without even leaving your home. 4 Is There A Way To Achieve Permanent Hair Removal Naturally? Laser hair removal has been growing in popularity since it first became commercially available in the 1990s. It can achieve permanent hair removal in as few as 3 sessions, although different hair types and densities will have different requirements. Laser hair removal works by shining a concentrated beam of light into the pore which is absorbed by the hair which has a pigment called melanin. The light energy which is absorbed becomes heat energy and causes the hair to warm up. This heat causes damage to the hair follicle, which can cause the follicle to stop growing hair. This method is extremely effective, but it is important to understand that because hair grows in cycles, not all hairs will respond to the laser therapy at the same time. Therefore, it will usually require multiple sessions to treat all the hair follicles successfully. Unlike waxing and epilating, laser hair removal will not have immediately noticeable results as it can take a few weeks for the dead hairs to fall out. However, unlike waxing which requires a certain length of hair at the surface for successful results, with laser hair removal you can shave in between treatments as you don’t need to have surface hair for it to work. 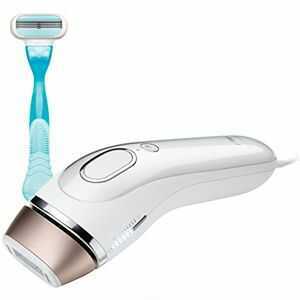 Shaving is encouraged before a laser treatment because it prevents the hairs from being scorched at the surface. In-salon laser hair removal can be expensive, with clinics charging about $1000 dollars for 8 sessions to treat smaller areas such as the underarms. That may put some people off, but an alternative to salons is buying an at-home laser hair removal kit. The Tria Laser 4X, for example, can be bought at a fraction of the cost, and you can use it anywhere on the body that you can get treated in a salon. You can treat multiple areas of your body for much less than you would pay for a single area to be treated in the salon. IPL is very similar to laser hair removal. It stands for Intense Pulsed Light and uses the same principle of using light to heat up hairs, causing damage to the follicle to prevent hair growth at the root. However, instead of using laser light to heat the hairs, it uses a broad spectrum of light which is less focussed. This may mean that more sessions are required to destroy the hair growth, but despite being less focussed, IPL still achieves great results, with many happy users. In salons, IPL treatments are often cheaper than laser hair removal, but you may find that because you require more sessions that it does not work out cost-effectively. An alternative is buying an at-home IPL hair removal device which costs much less than a salon treatment and can treat all the same areas. Just like laser hair removal, IPL does not require surface hair, so you can shave in between sessions without compromising the efficacy of the hair removal. Both the face and the bikini/Brazilian region of the body have skin which is more sensitive. Therefore, it is worth taking more time to consider what method of hair removal is best for you. Methods such as laser and IPL hair removal are suitable for use on the female face below the cheek line but are not suitable for eyebrows as the eyes are very delicate. These methods are sadly not suitable for the male face though, as the hair is too dense. Waxing is not a permanent hair removal solution, but it offers immediate results and is a popular choice for the bikini line. However, this region in particularly prone to ingrown hairs and folliculitis, which is an infection in the hair follicle. If you intend to wax your bikini region it is a good idea to purchase some tea tree oil or witch hazel, both of which have natural antiseptic and anti-inflammatory properties, which can minimise the risk of these side effects. As a permanent option for hair reduction of the bikini line, consider laser or IPL hair removal. It is long lasting, safe and affordable if you purchase a kit to treat yourself at home. Is There A Way To Achieve Permanent Hair Removal Naturally? Men and women alike are often keen to find natural, alternative options for problems such as unwanted body hair. This may be because they are worried about using harsh chemicals on their skin and because they want to know exactly what they are using on their body. Some natural hair removal methods can be successful in removing hairs, for example making your own wax mixtures by heating sugar, water and lemon juice until it combines and using it in place of commercially available wax or wax strips. Knowing exactly what has gone into the substance is a great benefit as you know there are no harsh chemicals. It can work out much cheaper than buying wax and you often have the ingredients in the cupboard anyway and the technique is suitable for both men and women’s hairs. However, this is not a form a permanent hair removal, it is a longer lasting but temporary solution just like waxing. Ayurveda is a traditional science of natural healing which originated thousands of years ago in India. It is a mind-body health system which is one of the world’s oldest holistic healing systems. It is based on a belief that health and wellness is a balance between mind, body and spirit, promoting good health instead of fighting disease. Ayurveda has a few different methods that claim to achieve permanent hair loss, including using different mixes such as turmeric, flour, tea, oil and potato-based mixes. However topical methods such as these are unlikely to succeed in achieving permanent hair removal, and although there are many suggestions for different hair removal approaches, there are few accounts of people who have used them successfully. Many of the methods such as those suggested for the face are bleaching methods which will make the hair more noticeable but will not remove it. The best options for achieving permanent hair removal are those which focus on preventing hair growth form the root. Topical creams, oils and mixtures used on the surface of the skin may help reduce the appearance of hair and remove surface hair but they are not going to prevent its regrowth. To find out more about permanent at-home hair removal solutions read our article on how laser hair removal works. Great information! It may be hard to decide what routines to start and which products to use to prevent it, if we have not a proper knowledge about it. Thanks for the wonderful article, it may be very helpful for everyone who is conscious about. It really depends on the requirement. We have different options now for hair removal. Interesting facts about Ayurveda and nature based treatments here. Thank you for sharing the information.